When Bill Gould looked at the "A Nose for Corkscrew Ties" page, he was inspired. He asked his wife Lois to assist him and they started searching his drawers and closet. They searched for hours, stopping frequently to rest and drink massive quantities of wine. Eventually - overcome by the aromas of their various finds and their unquenchable thirst, they slept. When they awoke, they took their finds outsite, squinted, and snapped a few photographs in the morning sun. 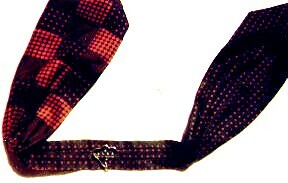 The first submission from Bill & Lois is this Harley Davidson Tie. It has a staghandled automatic knife of Italian steel for the fight after the drinking party. It was purchased in the back alley of the Harley Davidson motorcycle factory. It was forced into early retirement on July 4th, 1998 when its wearer tried to tighten a leaky sewer pipe. It is now lovingly called "eau de sewer." Function "meats" beauty with this stunning piece of 100% Alabama cotton. It was stolen from the employee locker room of New York's Le Cirque Restaurant in 1985. 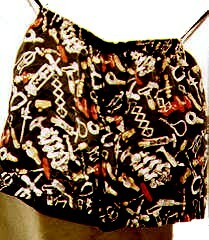 It has the wonderful and practical feature of a fully working corkscrew embroidered into the fabric. Most of the designs are actually food stains. The reader may form his own opinions about the food groups. This seemingly ordinary Hermes (Paris) tie has a nautical and military mystique. The theme on the front and back is swords. The magnificent surprise is on the back where a dagger is hidden inside the fabric. 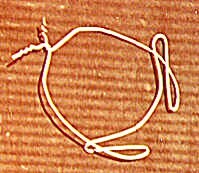 The sheath of the dagger removed, reveals a fine worm. 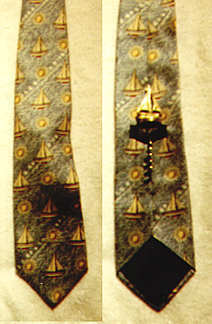 The tie was purchased in a New Orleans mansion. Significant odors of foie gras emanate from the scabbard. Another nautical tie comes from the Galleries Lafayette, Paris. The design of sailboats portends strong scents of saltwater rot and shows salmon gut stains on the lower front. The reverse reveals a brass ship corkscrew neatly tucked away in the tie stub retainer (what is that called anyway?). Not a tie but a great accessory. This formal cumberbund of 100% Afgani was made in Afganistan for Neiman-Marcus. This clever wearable sports a pocket on the reverse which holds an anchor corkscrew. Stains of Clos Vougeot 1933. Made in Korea for Designs by A. Rogers. Purchased in Wisconsin prestained with Colby cheese on the lower left. Further stains were added at a food fight during Lois' class reunion in Waukesha, Wisconsin. Lois has been removed from the alumni list. From a Vancouver, BC, Canada thrift shop. An apparent homemade bow tie with no distinguishing marks or patent data. The tie has a dual worm. It is adjustable in a somewhat awkward fashion by manuevering the folded wires on the backside. The tie can actually be used to open a bottle of wine. As a matter of fact - two at the same time. Can also be used to open car doors after a drinking fest causes you to lock your keys inside. 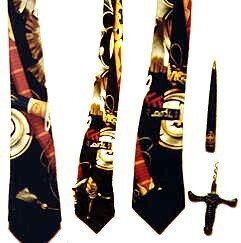 The tie is stain resistant and can be cleaned by immersion in soapy water followed by hang drying. A gorgeous 100% silk cravat by Sulka. Purchased in London 1996. Reversible with a fancy bow corkscew. No stains because it ties out of the way of most eating patterns. Now here's something to really seriously consider - if you invite Bill and Lois to your dinner party or for a night out on the town, will Bill wear this around his neck? Afterall, he did submit it to the tie competition. An important feature on this "piece de resistance" are the "straps" which are useful for a secret hiding of a passport or money stash. Perhaps you would like to sign up for a clothes shopping adventure with Bill and Lois? Description: Aroma of Ruffino Reserva Ducale 1956.